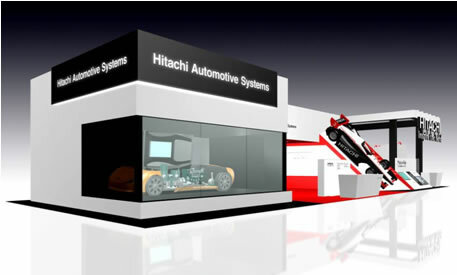 Tokyo, November 12, 2013 --- Hitachi Automotive Systems, Ltd. today announced that the company will exhibit at the 43rd Tokyo Motor Show to be held from Saturday, November 23 to Sunday, December 1 at the Tokyo Big Sight international exhibition center. Under the theme of "experience" and "feel" the next generation mobility technology to drive the future, the company will exhibit a wide range of products and technologies designed to support the global evolution of the automobile through system innovation and synergy solutions in the areas of the environment, safety, and information. Mobility technology is expected to evolve for the creation of a sustainable society. In the environmental field, state-of-the-art electronic control and electric drive technologies will be enhanced to create more efficient internal combustion engines and make further improvements in power-saving technologies for electric vehicles. In the field of safety, there will be an advance from collision safety to preventive safety. And in the information field, IT will be used to link automobiles and society, which will improve comfort and convenience as well as add value to automobiles. Next-generation mobility, in the form of linked, integrated electronic control and electric drive technologies, will be leveraged to make automobiles smarter and make automated driving a reality. For further advancement of electronic control and electric drive products, Hitachi Automotive Systems is using its superiority in electronics technologies in a Group-wide focus on development in the four system businesses of engine management systems, electric powertrain systems, drive control systems, and car information systems in the above three areas of the environment and safety, and information which creates value in the form of security, convenience and comfort. As well as strengthening its product capabilities in these areas and businesses, Hitachi Automotive Systems is focusing on innovation that links and integrates key electric control and electric drive system components into systems to achieve high-efficiency energy management and improved safety control, comfort, convenience and driving pleasure, and to add value to automobiles. At the 43rd Tokyo Motor Show 2013, Hitachi Automotive Systems will exhibit jointly with Clarion Co., Ltd., TOKICO Technology Ltd., and Hitachi Vehicle Energy, Ltd. in the Hitachi Group booth (Booth No. E2202 in East Hall 6), where there will be a display of synergy solutions that bring together the key technologies and expertise of the Hitachi Group. A wide range of Hitachi Automotive Systems products in the areas of the environment, safety and information will be shown using full-size car models and virtual screen images on a translucent screen. This provides an introduction to the systems innovation and synergy solutions of Hitachi Group companies, including Hitachi Automotive Systems, Clarion, and Hitachi Vehicle Energy, working to support next-generation technology for smart mobility, TOKICO Technology, working to support clean energy infrastructure, and Hitachi, Ltd., providing IT service solutions for automobiles. This is a nine-seater driving simulator that provides a realistic simulation of what it's like to be in the driving seat of an IndyCar, and to experience various drive control technologies developed by Hitachi Automotive Systems.